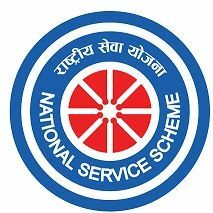 National Service Scheme was introduced to the student community in 1969, based on the recommendations of Dr. Kothari commission. The main objective is to utilize the energies of the youth by channelising them into community reconstruction. The scheme involves the youth all over the country for progressive and innovative restructuring of the society. The scheme’s logo was adopted from the famous emblem of Konark Sun Temple (The chariot wheel). The NSS day is celebrated on the 24th of September every year. One of the aims of NSS is personality development of the student through community service and developing among them an awareness of the problems the community is facing in particular and the problems the nation is facing in general. It involves making the youth partners in development programmes while making them learn and teach the virtue of self-dependence. Every NSS volunteer should know that the work done by him must get “quantitative success with qualitative work”. Our A.G. & S.G. College was established in 1975 .Its first NSS unit was started in the year 1975 with Dr. P.Kesava Rao, Lecturer in Botany as the programme Officer. Later, another two NSS units were sanctioned - one for boys and the other for girls. • The Volunteers of NSS units-I & II have participated in the “INTERNATIONAL YOGA DAY CELEBRATIONS” organized by the Siddhartha Academy of General and Technical Education, Vijayawada on 21st June, 2017. • The Volunteers of NSS Units I & II have participated in the ‘VANAM-MANAM’ programmes on 25th July, 2017. • An awareness programmes was organized on “ANTI-RAGGING” on 15th July, 2017 by the Police Department. • Students of N.S.S Units- I & II have rendered their services in Pamululanka village, Thotalavalluru Mandal to create awareness the people on various dangerous diseases in rainy season on 1st & 2nd of September, 2017. • N.S.S Units I & II jointly organized various activities under “Swachhata Pakhwada” from 1st to 15th September, 2017. • Volunteers of N.S.S and N.C.C Cadets in association with IQAC organized a Rally on the occasion of World Aids Day on 1st December, 2017. • Our college has two NSS units under the guidance of MR.D.Balakrishna and MR.N.Ramarao as NSS programmes officers. • Our NSS Volunteers have been actively participating in cleanliness of our college campus and looking of our gardening and plantation. • Our NSS unit – I and NSS unit – 2 have organized special camps from 28-01-2017 to 03-02-2017 in Penamakuru and Katuru villages respectively. • 150 of our NSS Volunteers had participated during Kumbamela of Krishna River from 12-08-2016 to 23-08-2016 and organized the queue lines at the bathing Ghats in Valluru and Thotlavallur. • On 25-01-2017 in connection with the national voter’s day our NSS Volunteers organized a rally bringing awareness about the right to vote. • NSS Units – II has organized Special Camp from 4th January, 2016 to 10th January, 2016 at Kanumuru village, Pamarru mandal, Krishna District. In this activity the the Principal, Volunteers and Smt.Lalitha, Member, Rotary Club and the village dignitaries have participated in the sapling activity. • The NSS Units – I&II have participated in the 1000 feet Flag March at P.B Siddhartha College, Vijayawada on 26th January, 2016 on the occasion of Repulic day. • NSS Unit –I&II have organized a Mega Blood Donation Camp on 9th December, 2015 in the Seminar Hall. In this camp 50 Voluteers donated blood. Sri Vadde Shobanadriswara Rao, Ex Minister and Sri Jampana Poorna Chandra Rao, Muncipal Chairman, Pricipal Sri K.Satyanarayana and eminent personalities of Vuyyuru have participated in this camp. • NSS Volunteers have Participated in the National Voters Day Rally on 25th January, 2016. • NSS Unit –II has Organized a Guest Lecture to the Volunteers on “Awareness on Seasonal Diseases and HIV AIDS” in the Special Camp at Kanumuru. • The Red Ribbon Club and NSS Units I & II in association with IQAC have orgnized a Rally on account of World’s Aids Day on 1st December, 2015. • N.S.S Volunteer Fareeda Bhanu has participated in the state level competitions conducted by the Krishna University on 6th January, 2015 won I place in Rangoli Competition. • The N.S.S Unit – I organized a Special Camp at Thadanki Village from 7th January, 2015 to 13 January, 2015. • N.S.S Volunteers and students of college Voluntarily donated a bag of rice, fruits, sweets to St.LUCAS GOOD HOPE SCHOOL, Vuyyuru on 19th February, 2015. • N.S.S Volunteers and students of college have donated Rs.10,000/- on 5th March, 2015 to G.Ramesh who has lost his legs in a road accident. • Sri D.Bala Krishna and Sri N.Rama Rao, NSS Programme Officers have attended an orientation training programme organized by UTOC,Andhra University, Visakhapatnam from 17th December, 2014 to 23rd December, 2014 at Montessori Mahila Kalasala, Vijayawada. • Sri D.Bala Krishna and Sri N.Rama Rao, NSS Programme Officers have attended an orientation training programme organized by UTOC,Andhra University, Visakhapatnam from 15th March, 2015 to 21st March,2015 at Krishna University, Machilipatnam. • N.S.S Unit-I&II in association with IQAC have organized a rally on “World Population Day” on 11th July,2014. • Mr.N.Vijaya Babu of II B.Com (Computers) has participated in the Winter Adventure Camp held at Narkhand in the state of Himachal Pradesh from 4th October, 2014 to 13th October, 2014. • 80 N.S.S Students have rendered their services in the campus cleaning programme under the activity of “Swach Bharath’ announced by the Prime Minister of India Sri Narendra Modi from 15th October, 2014 to 18th October, 2014. • N.S.S Volunteers rendered their service in the constructions of parking stand at the south area in the college premisess on 1-11-14. • N.S.S Volunteersrendered their services in the campus clean&Green programme on 07-11-14. • N.S.S unit-I&II conducted the maga Blood Donation camp in the Seminar Hall in the degree college campus on 15-11-2014 with the help of lions District Vijayawada. • N.S.S Unit-I&II Volunteersrendered their services in the swachBharat activity from 19-11-2014 to 20-11-2014 in the Vuyyuru town. • N.S.S unit-I&II Volunteers rendered their services in the construction of road in the backside of the office on 21-11-2014. • 18 students rendered their services in the construction of road in the backside of office on 24-11-2014. Rajendra - II B.Co Sivamma - III B.A. • N.S.S Volunteers rendered their services in the campus clean&Green programme on 07-11-14. • N.S.S Unit-I&II Volunteers rendered their services in the swachBharat activity from 19-11-2014 to 20-11-2014 in the Vuyyuru town. • A Blood donation camp was conducted in our college on 18thNov 2013 in association with Lions Club of Vijayawada and Andhra Bank, Vuyyuru. • NSS Volunteers participated in AIDS awareness rally on 1st Dec 2014. • NSS special camp was conducted in Yakamaru village from 18th to 24th Jan 2014. • NSS special camp was conducted in Akunuru village from 18th to 24th Jan 2014. • NSS Volunteers took part in Polio vaccination programme conducted by Andhra Pradesh State Govt. on 19th Jan 2014. • NSS Volunteers participated in Voters awareness rally called by Tahsildar, Vuyyuru on 24th Jan 2014. 1. V.RAJIVE BABU GROUP (B.Com) Secured 3rd place in the Solo Songs Event in the University Level Youth Festival 2011 – 2012 Organised at ACHARYYA NAGARJUNA UNIVERSITY on 6th January2012. 3. V.RAJIVE BABU GROUP (B.Com) got 1st prize in the FOLK DANCE in the Zonal Level Inter Colligiate Competitions conducted by GOVT. Womens collegeGuntur on 19th January 2012.